Medical staff at Palomar Medical Center Escondido presented the Palomar Health Foundation with a check for $50,000 on Monday, January 28 to go toward purchasing new furniture in the medical center’s café. Palomar Medical Center Escondido Chief of Staff Dr. Frank Martin said his fellow physicians have been saving money to make the donation for some time, seeing the furniture deteriorate after six years of use by patients, family and staff. “A lot of us go through there (the café) every day and we thought it would be good for the community to have new furniture,” Dr. Martin said. Palomar Health Facilities Management is working on a plan to best use the funds to purchase and install new chairs, tables and other furniture in the café that serves more than 4,000 visitors a week. 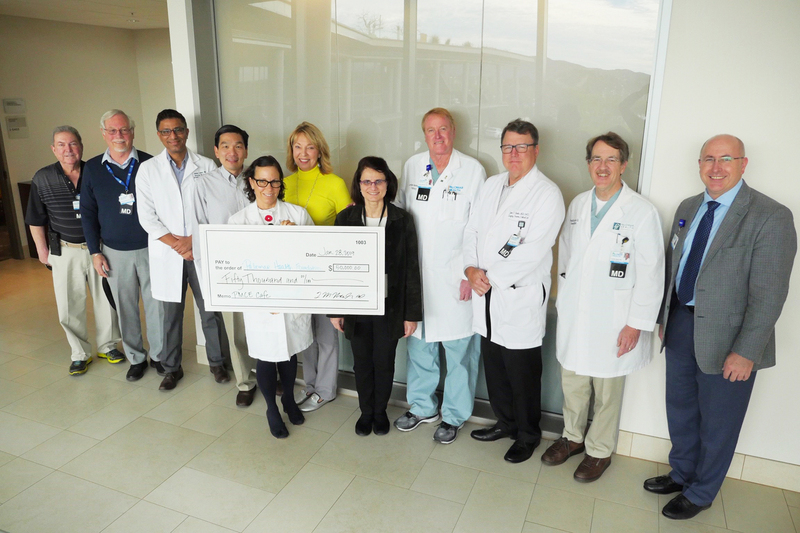 Shown in the photo (from left) Dr. Richard Greenstein, Dr. Robert McAuley, Dr. Adnan Zahid, Dr. David Lee, Holding check: Dr. Sandra Freiwald, In yellow, Dr. Eva Fadul, Dr. Sabiha Pasha, Dr. Lachlan Macleay, Dr. John Steele, Dr. Frank Martin and Wayne Herron, VP Philanthropy.